Fall is not complete at our house without a few pumpkin desserts. 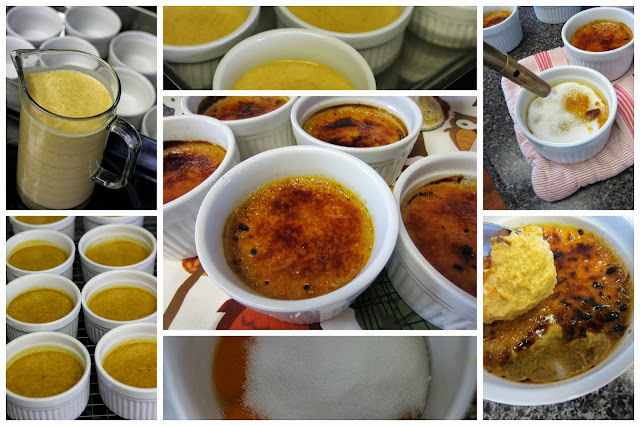 You might think that making a Creme Brûlée is tricky since it is so often served at fine dining restaurants but it is really easy and even better, is that you can make it ahead. It is a great naturally gluten free dessert. If you are using a pie pumpkin, cut it in half, remove seeds and place face down on a baking tray that is lined with parchment paper. Poke the pumpkin skin with a fork and bake it for about 40 minutes at 350 F. Cool it and then process until smooth. Measure out 1 1/2 cups. Place eight 6 ounce ramekins in a large pan with sides. Preheat oven to 350 F. Boil water in a kettle. Heat cream until steaming in a small saucepan over medium heat. In a large bowl, stir together pumpkin and spices, and vanilla. In another medium bowl, whisk egg yolks with sugar and slowly add heated milk while continuing to whisk. Add to the pumpkin mixture bowl and stir well. Pour through a fine sieve into a container that pours well. A jug works well. Pour into cups. Add enough hot water to the pan to come half way up the sides of the cups. Bake about 35 minutes until the custard is just set but still jiggly in the center. A knife inserted into the center should come out creamy. Remove from water and cool on racks. Place plastic wrap against surface of custard. At this point the custards can be refrigerated for several days. Be sure the custard is well protected from air. Once chilled, sprinkle surface with white sugar and using a kitchen blowtorch, heat the sugar until it begins to bubble and the surface is caramelized. The result will be a crisp top with a creamy pumpkin custard. Oh my goodness those look good!!! I think a kitchen blow torch should go on my Christmas list too Betty! We love brulee and this recipe sounds wonderful. Thanks for this great tutorial on how to make them. A blowtorch, eh? This marks a first for my recipe file! Maybe I could place the ramekins under the broiler and get the same effect.